How to try the “3 Napkin” Approach in getting Dropshipping sales ? People come up with this doubt a lot of times that why they are not getting enough sales or any sale at all. They are unable to get the reason behind not getting any sales. In this article we will tell you what might be wrong with your store or your ads that is not letting you get good sales. Not getting sales through your Dropshipping store is a very common phenomenon. A lot of people face this issue. This problem is common with people who get into this field without any prior market experience. We will break down the solution to this problem in this video. 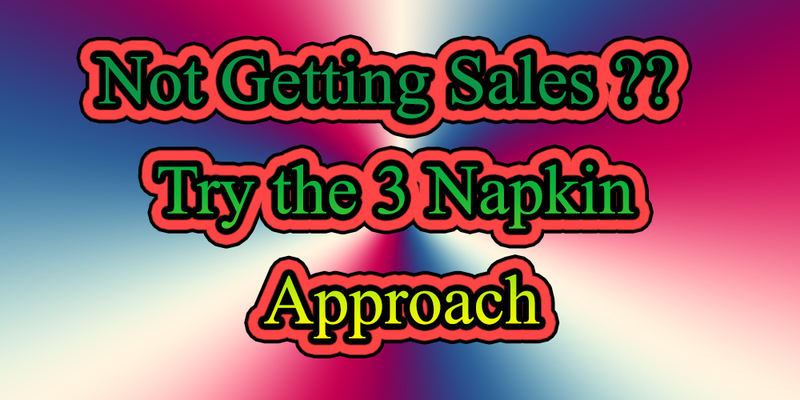 The “3 Napkin” solution: This is one of the best solutions to tackle low sales in Dropshipping. Under this solution there might be three things that could be wrong with your ads or store. The first thing that could go wrong with your sales is Clicks, second is the Add to cart and the third is Sales. You can use these steps to find out what is actually wrong with your store or ads. Why you are not getting any sales? 1.Clicks: The first reason you might not be getting any sales is that you are getting any clicks on your ads. Your product can itself be the reason why you are not getting any clicks. You might be advertising a way too saturated product for your advertising. If your product is very easily available in retail stores then people will not show any interest in your products. Ad creative: The second reason why you are not getting sales is the ad creative. Your ad is probably not engaging enough to get you good sales. Solution? You need to do product research again if your product is too saturated and if your ad is not engaging enough you need to make a new ad for your product. Make sure your ad has a good thumbnail. 2. Add to cart: if people are visiting your store and not adding any products to cart then there might be something wrong with your product. You need to make sure that people are not just clicking on your store but adding products in cart. Why you are not getting add to cart?? The reasons could be your Product Page, your site speed, your images and description on your site, product scarcity, your product price, and your product Branding. Solution? You need to work on making your product page interesting, your site speed and make sure that you have your products always in stock. 3.Sales: the final napkin is your sales. After you make sure that you are getting enough sales and click you need to make sure that you are getting add to cart customers. The next step is to get sales. In case you are still not getting any sales, you should try reverse engineering. The reason why you are still not getting sales after trying out all the three napkins can be your product price. Very high product price can be a turn off factor for your customers. There might be a lot people who are visiting your product pages and adding products to carts and not buying anything. It happens simply because of the price. It is ok to have high price if your product branding is good. You may try lowering your price if product branding is not that good. You need to win trust of your audience in order to get good sales. You need to work on your legal policies, return policies, log, etc. You can also go for changing your store name, domain and the logo and setting up a very engaging things for your store.